The United States Friday condemned the violence during the Sri Lankan elections Wednesday, and called for the perpetrators to be brought to justice. The State Department said however, the result of the polls, in which the main opposition United National Party swept the former ruling People's Alliance from power, was "basically free and fair." The head of the EU Electoral Observation Mission to Sri Lanka, John Cushnahan in a statement Friday, also condemned the violence as well as the blocking by the army of large numbers of Tamils from voting, but also endorsed the overall election result. The EU singled out for criticism, the PA and its Tamil paramilitary ally, the Eelam People's Democratic Party (EPDP). "Based on what we know now, the reports we have, the election appears to have been basically free and fair in most parts of Sri Lanka," said Mr. Reeker when asked to comment on the Sri Lankan elections at the State Department's daily press briefing Friday. "We do understand that violence, as I indicated, and some irregularities may have undermined the conduct of the election in some localities....But it appears that the major parties are accepting the election results as the will of the Sri Lankan people." "We want to condemn the many incidents of violence, especially the killing of 10 Sri Lanka Muslim Congress supporters in Kandy on election day, and we call for the perpetrators of those acts to be brought to justice," said Mr. Reeker. John Cushnahan in a statement Friday said "I would like to praise the people of Sri Lanka who turned out in such huge numbers to exercise their right to vote despite the murders, intimidation and violence experienced in some parts of the country. Unfortunately some people were denied the right to vote either because the army closed checkpoints or their votes were stolen or they were denied access to the polling station because of the existence of armed thugs." "Despite the problems that voters faced it would seem that the result reflects the political will of the people who clearly wanted change. The next government of Sri Lanka must be appointed in accord with the democratically expressed wishes of the voters. To ignore this principle would be to undermine democracy itself." In a preliminary report on its observations in Sri Lanka, the EU delegation said: "The PA and associated parties, such as the EPDP, have mis-used public and state resources to a high and visible degree. This has included using state vehicles, state buildings, state personnel and state funds to support their campaign efforts. Notably, individual ministers have used the resources of their ministries to further their candidacies," the EU delegation said. "There is also concern at the dominant role played by EPDP in the [election] process in Jaffna, with reports that some areas, and notably the islands, were closed to polling agents from other parties." With regards to the disruption of the results in the Tamil north and East, the EU observed: "The decision of the army to close checkpoints at Vavuniya and Batticaloa prevented many thousands of people from exercising their right to vote. It would seem that there is no justification for this action and serious questions have to be raised about the political motivation behind it." "The failure to ensure checkpoints were open and that transportation for these persons was allowed to pass represents a major infringement of their right to vote and has serious implications for the integrity of the process in the affected areas. However repolling will not take place in the cluster polling stations in the uncleared areas despite the fact that large numbers of voters were prevented from taking part." "The main concern is in Jaffna, where the registered electorate is some 633,000, but the number of persons actually resident is only about 500,000. This raises concerns as the voter cards and ballots are produced according to the registration figures, which means there is effectively a large "surplus" of voter cards and ballots in the peninsula," the EU said. The EU also said: "We intend to monitor the progress of investigations into the many incidents of violence that occurred. The public deserve reassurance that those guilty of acts of violence irrespective of their party allegiance or the office they hold, will be subject to the full rigours of the law. The impartial enforcement of the rule of law is also an important cornerstone of democracy." 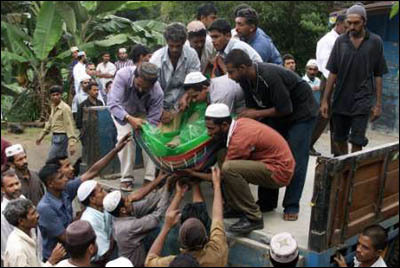 Muslims carry the body of a victim of clashes with an armed gang in the village of Madawala near the central hill city of Kandy 112 km from Colombo on December 6, 2001. Sri Lanka Muslim Congress said nine of its supporters were shot dead in a clash with supporters of the People's Alliance (PA).